California produces 99% of the walnuts grown in the U.S. and 38% of those grown worldwide. Walnut blight is the most destructive disease of walnuts and is caused by a bacterium that infects only walnuts. When the nut is infected, the infected area turns black as the bacteria invade the surrounding tissues. Drops of black slimy exudates containing myriads of bacteria and decomposed cellular materials may ooze out of the lesions. Control studies were initiated in 1930 and were carried out by the federal government for 16 years. The research demonstrated that the only practical method of controlling walnut blight was by spraying or dusting with protectant bactericides. 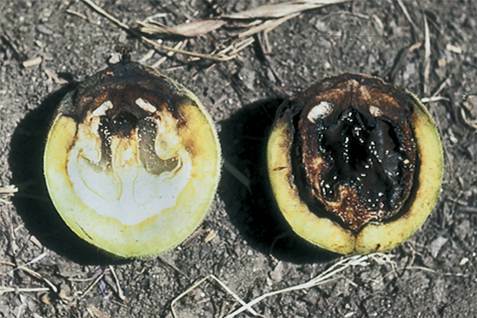 Control practices for walnut blight have not changed substantially for decades. They are still based upon use of copper-containing materials. “Walnut blight, depending on the variety, the weather and the pathogen populations, can cause significant crop loss. Such was the case in 2012, when some Chandler walnuts in the late leafing varieties saw 15 percent damage. Rick Buchner, University of California Cooperative Extension farm advisor for Tehama County, said he thinks growers may have become lulled into a false sense of complacency because they haven’t had a lot of problems with blight in recent years. Consequently, they weren’t vigilant in their management practices as they’ve been in the past, he added. A lesser treatment program was used that worked well in the past several years when there was low blight pressure, Buchner said, but that has resulted in the inoculum building. Reverting to old management practices will bring the blight under control, Buchner said. “We’ve actually done that. It’s taken us two years to beat it back down,” Buchner said, recommending that growers plan for two very aggressive treatment years to take it back down. “Copper spray is not cheap, but it’s a lot cheaper than 10 percent loss of walnuts,” Buchner said. Source: Ag Alert. January 16, 2013. Pgs. 9-10. This entry was posted in Uncategorized and tagged California, copper spray, Walnut Blight by pesticide guy. Bookmark the permalink.